Functional analysis is a central subject of mathematics with applications in many areas of geometry, analysis, and physics. This book provides a comprehensive introduction to the field for graduate students and researchers. It begins in Chapter 1 with an introduction to the necessary foundations, including the Arzela-Ascoli theorem, elementary Hilbert space theory, and the Baire Category Theorem. Chapter 2 develops the three fundamental principles of functional analysis (uniform boundedness, open mapping theorem, Hahn-Banach theorem) and discusses reflexive spaces and the James space. Chapter 3 introduces the weak and weak$^$ topologies and includes the theorems of Banach-Alaoglu, Banach-Dieudonne, Eberlein-Smulyan, Kreibreven-Milman, as well as an introduction to topological vector spaces and applications to ergodic theory. Chapter 4 is devoted to Fredholm theory. It includes an introduction to the dual operator and to compact operators, and it establishes the closed image theorem. Chapter 5 deals with the spectral theory of bounded linear operators. It introduces complex Banach and Hilbert spaces, the continuous functional calculus for self-adjoint and normal operators, the Gelfand spectrum, spectral measures, cyclic vectors, and the spectral theorem. Chapter 6 introduces unbounded operators and their duals. It establishes the closed image theorem in this setting and extends the functional calculus and spectral measure to unbounded self-adjoint operators on Hilbert spaces. Chapter 7 gives an introduction to strongly continuous semigroups and their infinitesimal generators. It includes foundational results about the dual semigroup and analytic semigroups, an exposition of measurable functions with values in a Banach space, and a discussion of solutions to the inhomogeneous equation and their regularity properties. The appendix establishes the equivalence of the Lemma of Zorn and the Axiom of Choice, and it contains a proof of Tychonoff’s theorem. 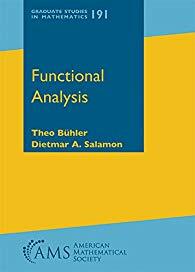 With 10 to 20 elaborate exercises at the end of each chapter, this book can be used as a text for a one-or-two-semester course on functional analysis for beginning graduate students. Prerequisites are first-year analysis and linear algebra, as well as some foundational material from the second-year courses on point set topology, complex analysis in one variable, and measure and integration.